Garbage disposals are some of the most frequently used appliances in the kitchen. Because they are subjected to a lot of daily wear and tear, certain issue are very common. In most instances, problems are minor and easy to fix. Other times, though, problems are more serious and require the attention of a professional plumber. If you are in need of garbage disposal repair in Rochester or the surrounding areas, trust the plumbers right here at GT Campbell Plumbing. Stuck Objects. The majority of garbage disposal problems arise as the result of a stuck object. Foreign objects, such as silverware or even small pieces of wood, can become jammed in the disposal, preventing it from functioning properly. If there is a foreign object stuck in your disposal, unplug the unit and call a plumber for further assistance. Clogs are also common garbage disposal problems. Certain foods – like grease, fats, oils and fibrous vegetables like celery – can cause blockages and prevent your disposal from working. They can also lead to unpleasant odors. If you put too much food in your garbage disposal, it may turn itself off because it is overloaded. This occurs to prevent the unit from overheating. In most cases, resetting the disposal solves the problem, but not always. If your garbage disposal has stopped working or if it is making unusual noises, you should contact a plumber right away. 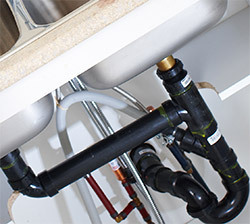 Working on your garbage disposal yourself can be dangerous if you don’t know what you’re doing, and you could end up causing more damage and facing additional expense. When you need garbage disposal repair in Rochester or the surrounding areas, call GT Campbell Plumbing your trusted plumber in Rochester NY at .